This year I went to the Kensington Dolls House Festival in May, seriously in the market for a shop/house kit. I wanted Victorian/Edwardian style, not difficult to find, you’d think. But nothing clicked until I was about to leave and found the Sid Cooke stand near the main door. 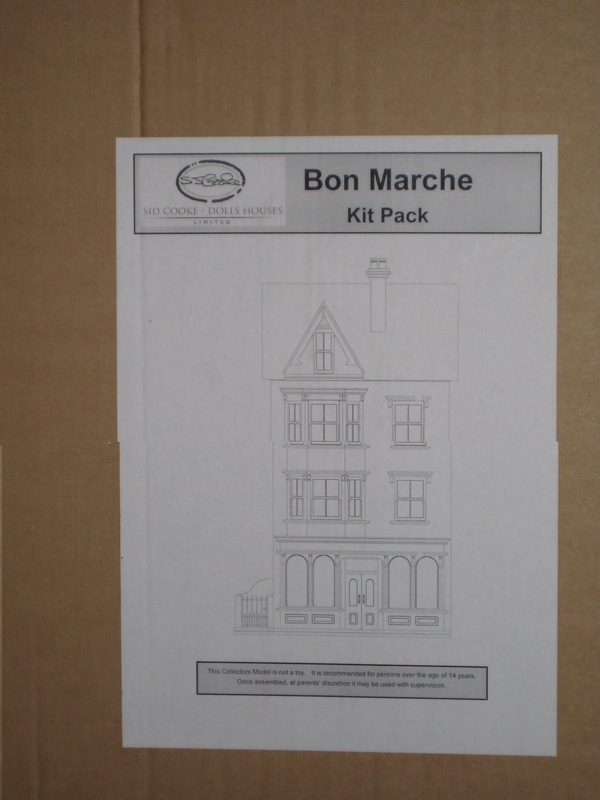 I hadn’t seen the Bon Marché on their website – it still hasn’t appeared – but there in Kensington stood the prototype: a ground-floor shop with not one but two storeys of accommodation above, plus an attic floor with a further two rooms. For those familiar with Sid Cooke designs, it’s a sort of blend of the Empire Stores and Silver Jubilee house. 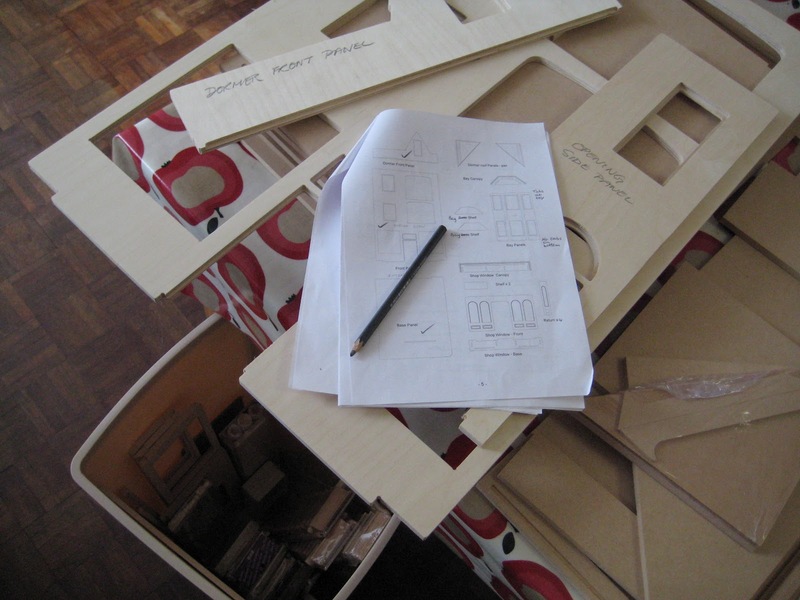 The flat pack was safely delivered in July by the proprietors themselves, who were visiting London on business. So far the kit has been checked over and marked up for assembly. And there’s going to be one significant addition from me. On the right is a back door that will give out into a narrow yard complete with a privy (to hide the power supply unit). This increases the base width by 15 cm (6 in) and involves supporting the join between the main base plate and the extension with a solid sheet of 3-ply. There’s still a lot of standard preparation to do too, like sanding, sealing, and working out the lighting plan. So it looks like a long task ahead . . . I hope you’ll drop in now and again to watch it taking shape. What a wonderful house! I'll look forward to your progress on this, my favourite period (my cottage is set roughly in 1947). Thanks Christine and welcome, it's good to hear from you directly. Yes, I too find the late 1940s such a rich vein, and though the austerity in Britain was no fun at the time it gives miniaturists like us huge scope for techniques like distressing surfaces and dressing sets with a 'make-do-and-mend' air, doesn't it?